"Possible Futures for Downtown Los Angeles"
What possible futures exist for a sustainable downtown Los Angeles? For nearly half a century downtown Los Angeles was virtually abandoned as a place to both live and work. In recent years however, some urban renewal plans have come to fruition, and many more are being considered - bringing life back to the urban core. Using the Not a Cornfield project site and the surrounding areas including the Los Angeles River as contextual anchors, four urban thinkers and planners will discuss these issues, offering a few possible and probable futures to look forward to. James Rojas is founder of the Latino Urban Forum (LUF) which is group dedicated to improving the Latino built environment through urban planning and advocacy. LUF has worked on many projects such as the Evergreen Cemetery Jogging Path, South Central Farm, and the Cornfields. He holds a Master of City Planning and a Master of Science of Architecture Studies from the Massachusetts Institute of Technology. His research is one of the few studies on U.S. Latino built environment and has been highly cited. Excerpts have been widely printed in publications like Places and the Los Angeles Times. For the past 8 years James has lectured extensively at universities, colleges, conference, high schools, and community meeting on his research. His goal is to empower Latinos in how to understand their environment. James Rojas has spent 3 years in the East Europe in the Peace Corps organizing environmental groups for sustainable transportation. Mr. Rojas's currently is a project manager for the Los Angeles County Metropolitan Transportation Authority, Central Area Team and works on transportation enhancements projects. Michael Dear is professor and chair of the Department of Geography at the University of Southern California, and honorary professor at the Bartlett School of Planning at University College London (England). He is currently researching urban and cultural change along the US-Mexico border, and has just completed a 4,000-mile exploration of the borderlands (on both sides). His most recent book is Postborder City: Cultural Spaces of Bajalta California (Routledge, 2003; edited, with Gustavo Leclerc). Lane Barden Lane Barden is a Los Angeles-based photographer, teacher and writer. He has taught photography at SCI-Arc and Art Center College of Design. His photographic project "The Los Angeles River: 52 Miles Downstream" was shown at SCI-Arc in a solo show in the Spring of 2005. Selected images will be exhibited in L.A. River Reborn opening at the Skirball Cultural Center April 6, 2006 and will be published in a forthcoming book on Los Angeles infrastructure, edited by Kazys Varnelis and ACTAR Publications of Barcelona. Lane Barden's commitment to the future of the Cornfields and the Los Angeles River is anchored in his vision of a performance-based public space in the L.A. River at the Cornfields created by a computer operated inflatable rubber dam installed in the channel. 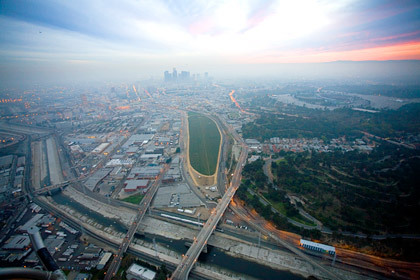 "The Los Angeles Waterway Project" has received coverage by the New Yorker magazine, National Public Radio, The Los Angeles Times, and KCBS (Ch. 2) and KCAL (Ch. 9) in Los Angeles. The idea is not to create a lake, but to invite people down to the channel for a good time. Alan Loomis is the principal urban designer for the City of Glendale, California. Previously he was an urban designer with Moule & Polyzoides Architects and Urbanists, were he directed planning projects for Pomona College, the University of California Santa Barbara, and various cities in the Inland Empire and Central California, in addition to participating in other urban design and research projects throughout California, New Mexico and New Jersey. He has taught urban design at Woodbury University, and written for ArcCA, loudpaper, among other journals, and co-edited Los Angeles: Building the Polycentric Region, a survey of regional smart growth architecture and urbanism. He has served on the board of the Los Angeles Forum for Architecture and Urban Design, the local Congress for New Urbanism chapter, and he is the creator/editor of DeliriousLA, a comprehensive weekly listing of architecture events in Southern California. David Fletcher is an urban and environmental designer, professor, and writer. He holds an MLA with Distinction from Harvard University, where he studied Urban Design and Landscape Architecture. He also holds a Bachelor of Art in Studio Art and Bachelor of Science in Landscape Architecture from the University of California at Davis. He is presently working at Mia Lehrer and Associates on a range of projects including civic spaces, parks, and regional planning projects. He is interested in the unique systems and forms that evolve from sustainable design practice. More specifically, his work addresses process, void, symbiosis, infrastructure, and post-industrial urbanism. As project manager for the Los Angeles Revitalization Master Plan, he is leading efforts to identify and plan a comprehensive open space network that interfaces with channel restoration and urbanism. He is also managing the Compton Creek Master Plan and the LA Riverfront Park projects. He has taught urban design and landscape architecture at Harvard Design School, the Centre d'Etude et díUrbanisme in Saintes, France, and at the USC School of Architecture. He has recently authored a paper "Imprinting Watershed Awareness through Environmental Literature and Art" in Facilitating Watershed Management: Fostering Awareness and Stewardship, edited by Robert France and his writings on the Los Angeles River will be published in a forthcoming book on Los Angeles infrastructure, edited by Kazys Varnelis. David was the assistant curator and exhibition designer of "Inhabiting Infrastructure", at the Harvard Design School. His temporary art installations have been shown at Connemara Sculpture Park, Harvard Design School, Davis, USC, and in Art Center's GardenLAb exhibit. His recent work on postindustrial urbanism was been honored with a 1st place national award from the American Society for Landscape Architecture. He also received an Honor Award in 2004 from the Boston Society of Landscape Architects for environmental planning work in Beirut, Lebanon. Growing in the historic center of Los Angeles, the Not Cornfield project transforms an industrial brownfield site into a cornfield for one agricultural cycle. Now the Los Angeles Historic State Park, the site popularly known as 'The Cornfield' had remained derelict for more than a decade. The project serves as a potent metaphor that provides a focus for reflection and action in a city unclear about the location of its energetic and historic center. Lauren Bon resides in Los Angeles and holds a Masters of Architecture degree from MIT and a BA from Princeton. Ms. Bon is a trustee of the Annenberg Foundation and President of Not A Cornfield, LLC. Her recent urban, public and land art projects in the U.S., Hong Kong, Belfast and Northern Ireland, as well as her role as a trustee, make her uniquely poised to build the capacity of the Foundation in the area of site based philanthropy, serving communities through education, civic, health, artistic initiatives and programs. Not a Cornfield art project is being developed through a grant by the Annenberg Foundation.